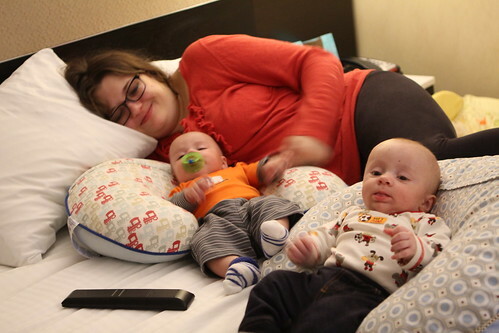 In our last blog entry Jen touched on where we were at as far as evacuating to a hotel. All five or six readers of the blog follow us on Facebook so you know that we are still alive. I can imagine the long absence since her entry would be scary if you didn't know that. Today I will attempt to bring to you an exhaustive and rambling account of what has happened since the last pre-storm blog entry. We were supposed to attend a costume party at our friend Paul and Caolan's. I began my trip from Manhattan and Jen began her trip from home. After an hour of travel we were both extremely far from their place. There is no good way to enter Brooklyn on a Friday night. It is an exercises in futility. Sadly only we were able to enjoy their old-timey strongman costumes. Saturday we got a visit from Jen's aunt Wendy and Uncle Glenn. They came over, bought us dinner, and even helped us bring all our boxes of stuff out of the basement. It was a great visit for us. They might never be back though. 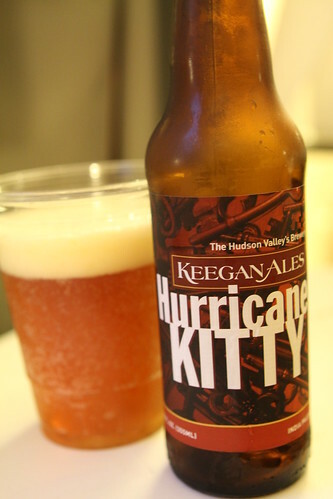 Along with dinner we had this Hurricane Kitty beer from Keegan Ales. It was still early into the storm so it seemed playfully appropriate. Sunday began with a brisk, early-morning evacuation. 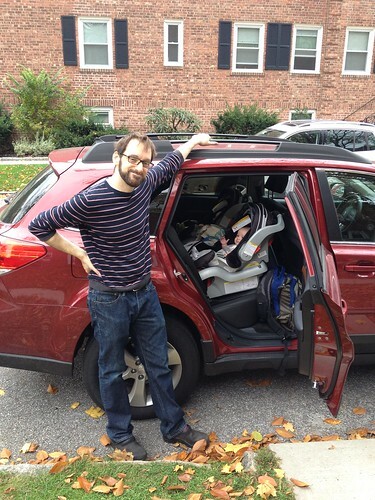 We packed up all of our valuables, the four hundred things the babies need for a getaway, and headed out. 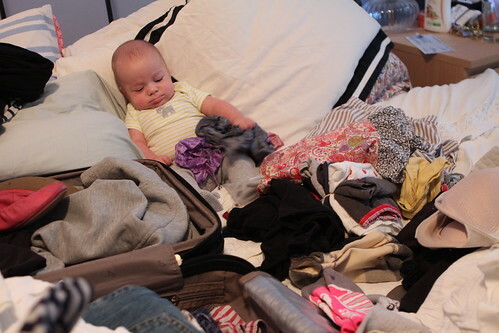 Elliott helped Jen pack. He was extremely helpful and, at times, resembled E.T. in the closet. 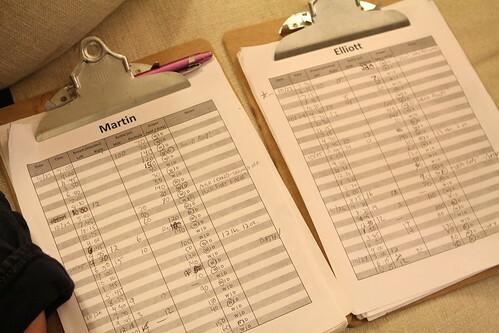 I used this opportunity to suggest we finally end the task of logging the babies' feedings and diaper changes. With everything else going on this left us two less things to pack and far less work for our time on the road. If we'd gotten a car one cubic foot smaller than the Subaru Outback we would have had to probably leave more behind. Most likely it would have been either me or Jen. I had to withdraw a bunch of money from an ATM as I felt obligated to give large tips to the bellboys who helped us load and unload this mess. 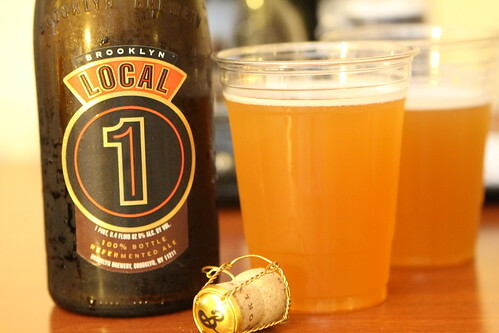 We started out the night with a bottle of Brooklyn 1 from Brooklyn Brewery, a beer I haven't had in a few years. After I got in for the night we ordered room service and had extremely sub par Italian food: pasta puttanesca, and some sort of eggplant dish. 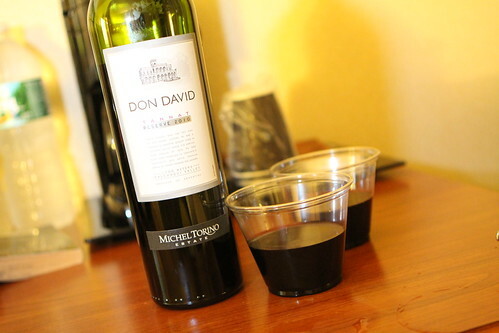 Dinner was saved by our first ever wine from Uruguay. It was very nice, making up for the halfassedness of the puttanesca. After dinner I came down with my first cold of the 2012-2013 season. On the day of the storm we were stuck in the hotel so we made the most of it. We have been avoiding bringing the babies out to eat but on Monday it could not be avoided. 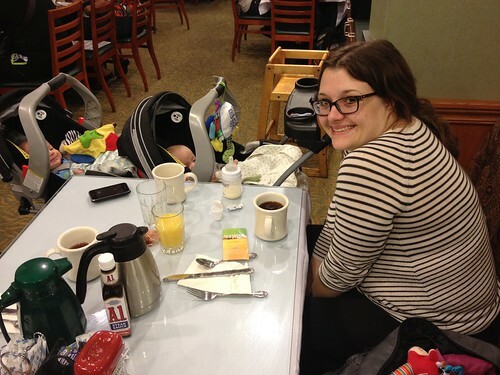 We took them to the hotel restaurant for breakfast. 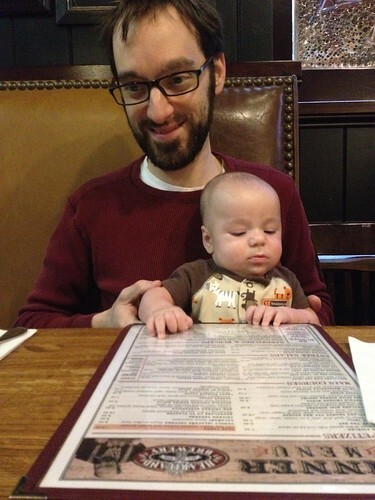 It was sort of cheating but a nice way to ease them into eating out. For lunch we made a picnic out of whatever leftovers we could scrounge up from the grocery store: cheese, hamburger rolls, and some assorted salads. We passed the time by watching the news and Jen tended to Martin's scalp which was quite dry and flaky. Martin was not as interested as she was in clearing this up. 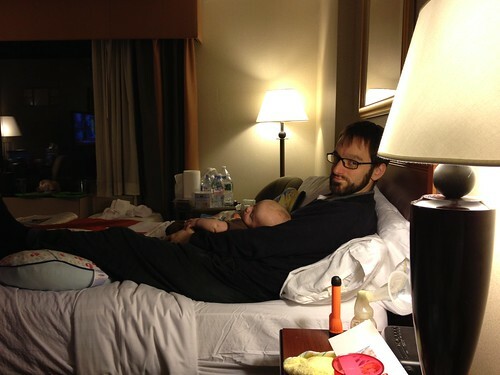 After dinner Jen put Martin on me to warm me up while I was having chills. 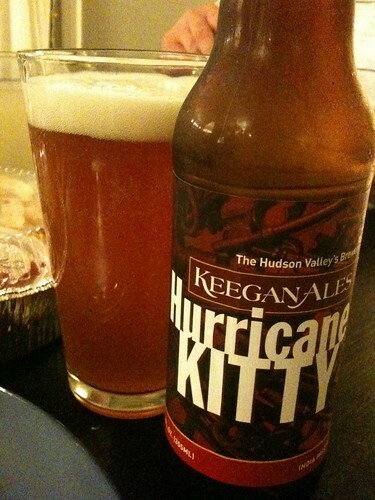 For beer we, once again, enjoyed some Hurricane Kitty before the wind and rain lulled us to sleep. 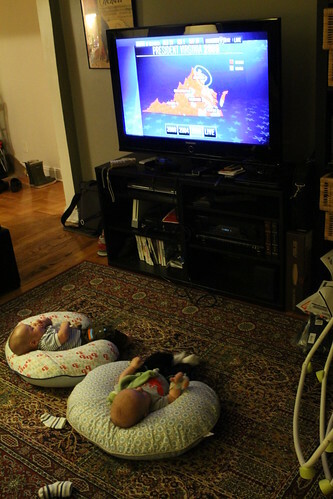 Tuesday started off with a depressing viewing of the morning news watching the effects of Hurricane Sandy as they came in. Jen did get a chance to dress the guys up in their hurricane gear and take them out for a spin in the afternoon. 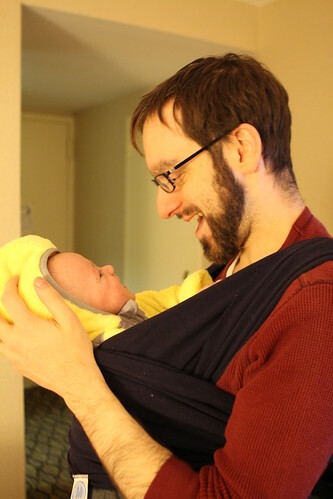 I passed a ramen restaurant on my way back to the hotel and when I got there I bundled Martin up while Jen wrapped me in my least favorite baby carrier and I took him out to pick up dinner. 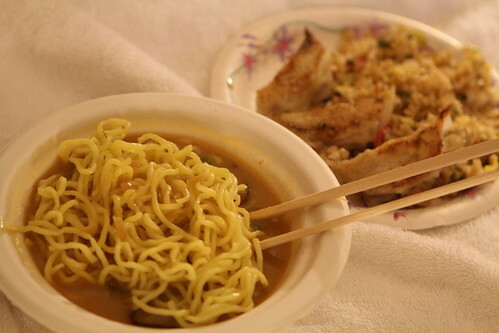 After a long day of work and feeling super sick, ramen was the perfect dinner even though I spilled a good portion of it on the bed at the hotel. 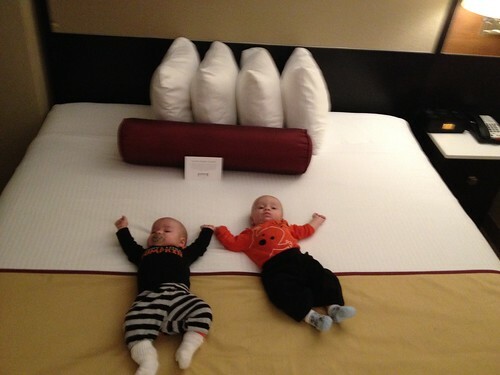 Thankfully we had two beds: one for sleeping in and one for eating on. Also, thankfully, I had taken out all that cash to leave the chambermaids a nice tip. Halloween was supposed to be a day off of work where I spent the day at home dressing the Wombats up in various costumes. Instead it ended up being the day we were forced to check out of our hotel. Luckily good friends of ours were able to get us into another hotel which had apparently been entirely reserved for French marathon runners. It was an extremely nice hotel and after watching the news all day and seeing what the rest of New York and New Jersey were going through we felt very lucky to have somewhere warm to sleep. The next day we woke up in our fancy Times Square hotel. The Wombats quickly perfected a way of taking up an entire king size bed with their tiny little frames. 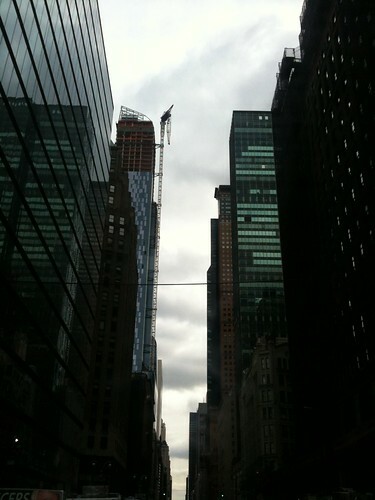 On my way to work I saw the broken crane which, at least in New York, had become a sort of local celebrity. I took this picture mostly because there were fifty or sixty other people standing on 57th Street taking pictures and I wanted to fit in. 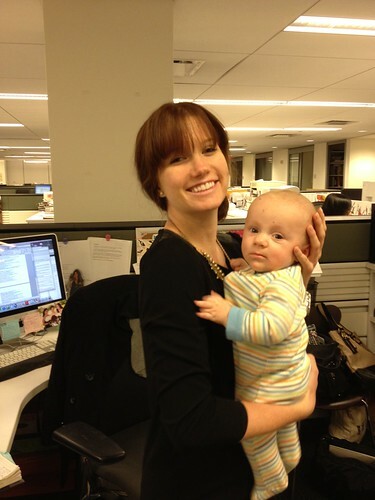 Meanwhile, Jen also went to work where she was forced to bring the babies. From what I hear they were extremely beneficial to her workplace productivity. Hey, what happened to Elliott? Did Jen leave him back at the hotel? 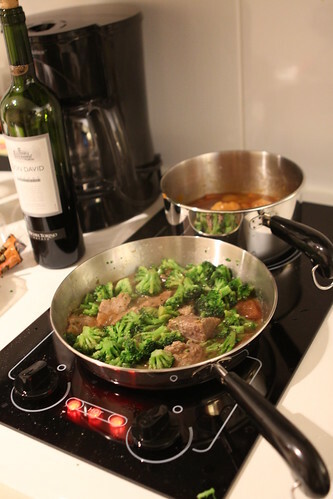 I'm not sure if Elliott stayed back at the hotel or not but Jen was able to cook up a little dinner before I got home. We got some frozen chinese food and were able to heat it up on the stove. 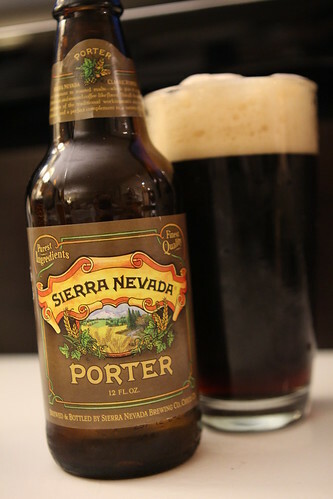 With dinner I was, for some reason, in the mood for a porter so I cracked open a Porter from Sierra Nevada Brewing Co. It actually worked surprisingly well with Chinese. 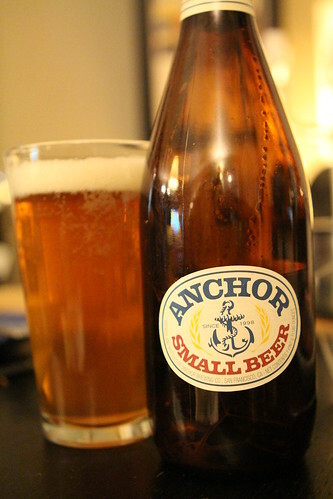 We also opened an Anchor Small Beer. 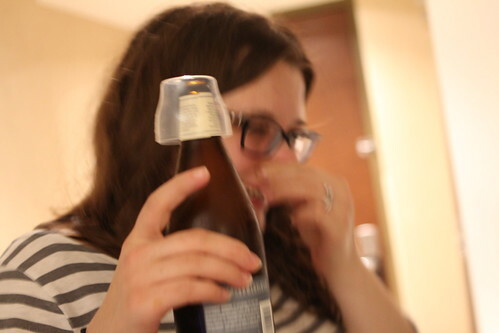 When we weren't able to finish it Jen came up with the brilliant idea of putting one of the babies' bottle lids on top to keep it carbonated. As you can see this was as perfect a solution as it was a fit. The next day Jen began to get my sickness. I went down to get breakfast for her, a trip that would take approximately twenty minutes of waiting for an elevator full of French marathoners followed by me elbowing my way through a very crowded dining area. I was quite surprised to find that they had put out a tray of pumpkin pie slices along with the bagels, bread, granola, and other breakfast items. I wondered if they were just so desperate for food with the hurricane shortages that they were just stretching with this one. She spent much of that evening lounging around with the babies as she was not well. 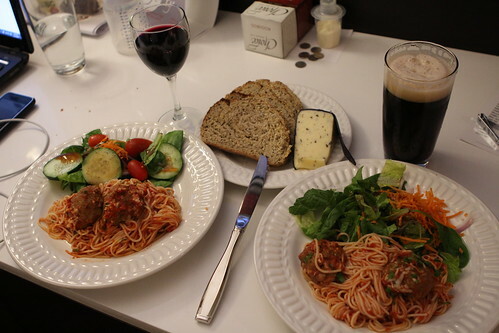 While she rested I made some spaghetti and meatballs which I served with salad, bread, and cheese. 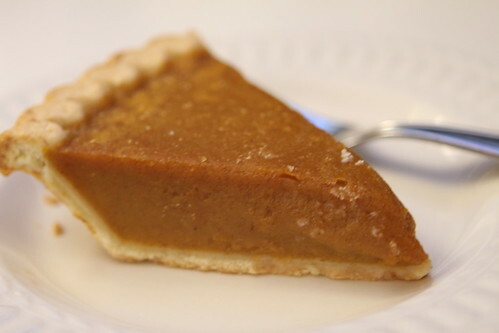 I also served up the piece of pumpkin pie I'd snagged from the morning's breakfast buffet. It held up surprisingly well. Saturday was my birthday. I celebrated by working my last shift of the week then returning to the hotel where I felt as though I may collapse from exhaustion. 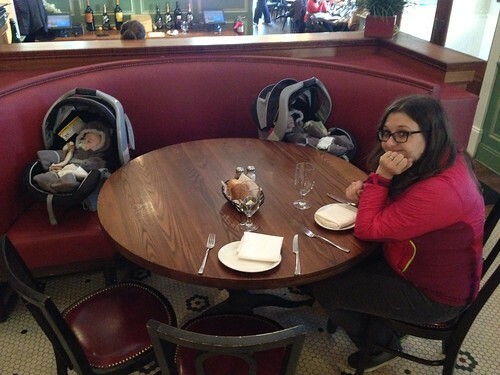 Instead of sleeping we went out, took a walk with the babies to Columbus Circle, then on our way back to the hotel we stopped at Heartland Brewery for dinner. 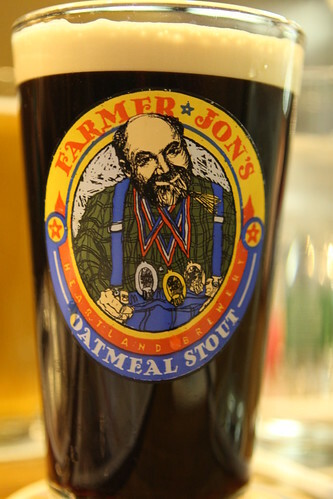 Since my birthday also happens to be International Stout Day, I celebrated appropriately with the Farmer Jon's Oatmeal Stout at Heartland Brewery. 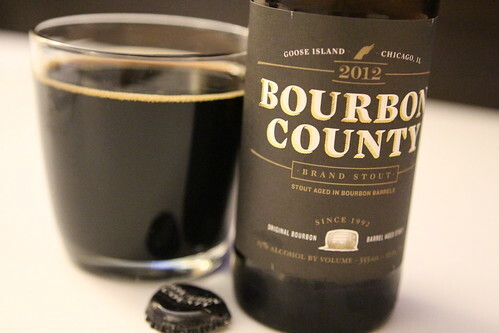 Back at the hotel I celebrated even more appropriately with the Bourbon County Stout from Goose Island. This was a very, very serious beer, and probably one that I didn't necessarily need to have after already having had beer. At 15% alcohol by volume I felt quite celebratory. I had a leftover cake slice from the afternoon so I went down to the hotel "pantry" where I was able to purchase a pint of Hagen Daaz for the comically high price of $9.00. 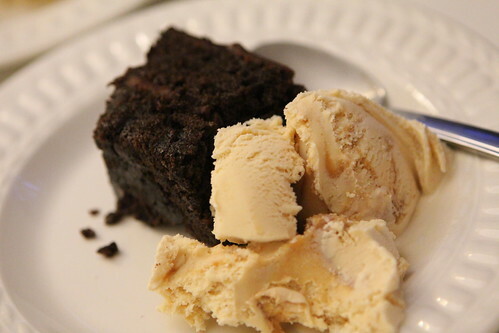 Even though we only had two scoops it was extremely enjoyable. 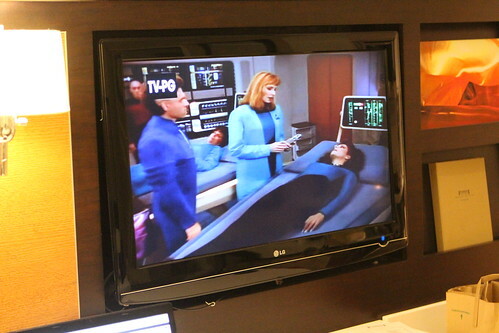 After dinner we settled back with BBC America which seems to be a channel that only plays shows about Richard Hammond and Star Trek: The Next Generation. Not the birthday I had imagined I'd have but probably one of the more memorable birthdays of my life. The next morning was our last at the second hotel. Because of the marathon and the hurricane there were no hotels within a 50 mile radius of us. We realized that we would have to pack the babies up and head home where the power was not scheduled to be restored for another seven days. Home, where we had no power and no heat, was not exactly what we'd hoped for but we realized we'd need to take a chance and head back. 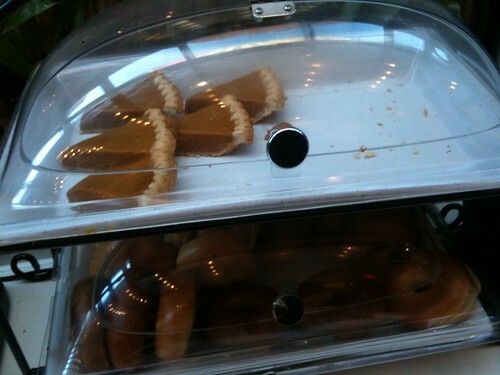 For the third consecutive day the pumpkin pie slices were put out for breakfast leading me to believe that it was not a mistake or a desperate attempt to fill the buffet but rather a regular staple at this particular hotel. The funny thing is that I expected the French people to laugh at the 'silly American' breakfast. Instead they attacked the platter as it was put down and there were only a few slices left by the time I could get close enough to take this picture. 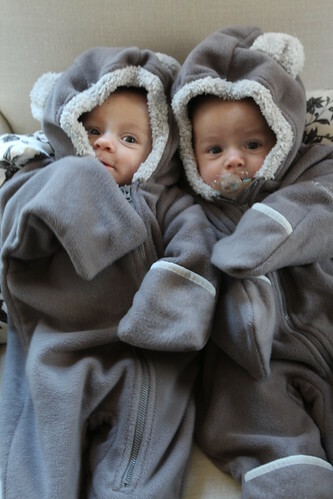 When we got home it was so freezing cold that Jen dressed the boys up in their snowsuits. I felt this made them look like Tanooki Mario and Tanooki Luigi. Jen did not believe that 'Tanooki' was what Mario and Luigi was called. I reminded her of who I was. This seemed to settle that debate before it started. Since we were on such a roll with the boys we took them out for a leisurely lunch in town where we could take our sweet time enjoying their electricity and heat. We also enjoyed how it did not smell like disgusting, rotting food. We were apparently the only ones there not attending some sort of childhood gathering where they were entertained by the world's foremost balloon animal expert. Everyone there had near lifelike renditions of Spider-Man, Ariel the Mermaid, and assorted other trademarked characters. After a trip to Home Depot to pick up garbage bags we spotted some lights on our street and returned home to sweet, sweet electricity! Unfortunately we also returned home to a not-so-sweet smell of a fridge full of rotting food. 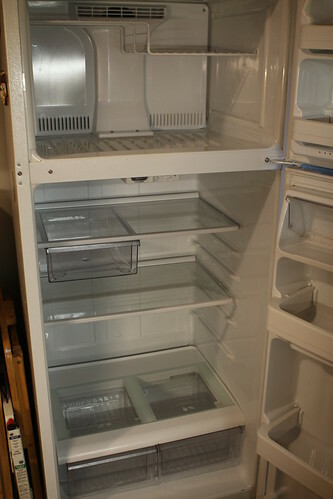 I spent the next hour or so tearing the fridge apart, throwing away mostly everything, and cleaning it out. 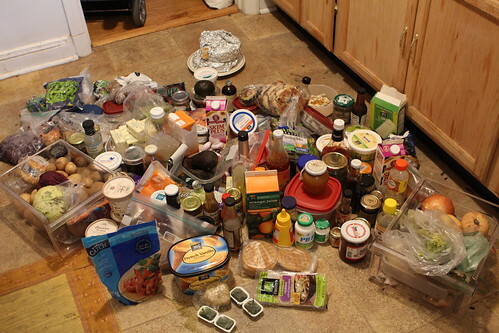 While I hate throwing away food it was sort of nice to start from scratch with a completely empty fridge. Of course this will lose some of its charm as we have to slowly spend money to stock it back up. After going to pick up my car from a friend her father was kind enough to give me a container of homemade chicken soup and chicken cutlets. Along with another Anchor Small Beer (one of the official beers of Hurricane Sandy), I have to say this may have been one of the most memorable meals of my life. It was so good I actually can't stop thinking about it. After dinner we had a surprise visit by Uncle Paul . . .
. . . and Aunt Tequila! 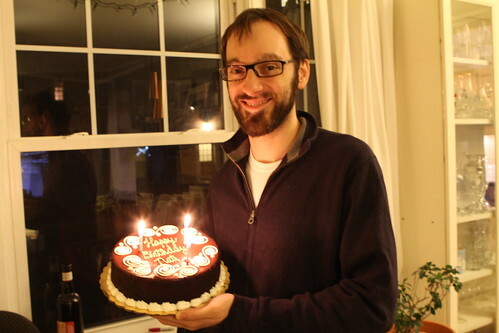 They were kind enough to bring me a cake from one of my favorite Rhode Island bakeries, as well as spend some time with us and the Wombats in our freezing apartment. Combined with the unexpected return of power and the great home-cooked meal this made for an A+ evening. 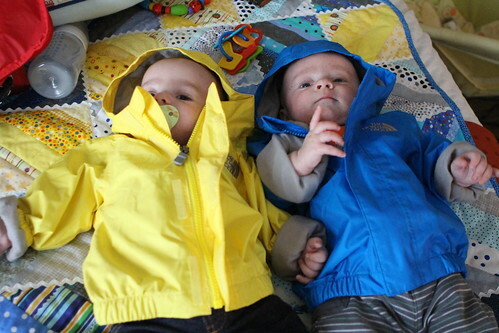 Monday morning was time for the babies' first day in daycare. We dressed them up and brought them over along with all their assorted paraphernalia to the daycare place where we hoped that they would not report us to Child Protective Services when they saw Martin's self-inflicted cuts all over his face. Afterward Jen picked up the farm share after last weeks' pickup was canceled due to the hurricane. 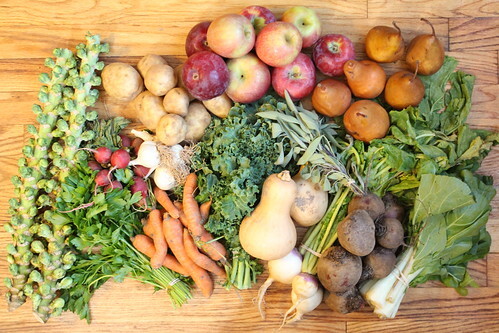 This week we got beets, carrots, Brussels sprouts, butternut squash, garlic, sage, radishes, boc choi, potatoes, parlsey, kale, turnips, apples, and pears. Today was a day off of work. 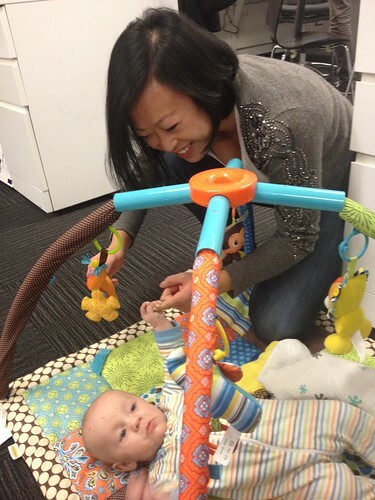 This was unfortunate because a day at work would have been much more relaxing. 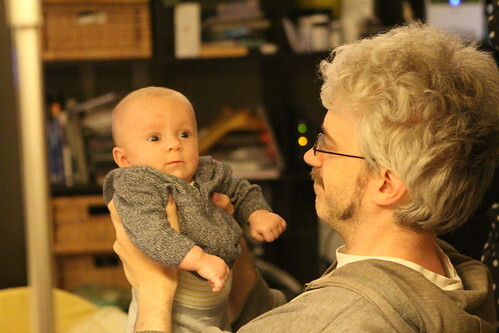 I took the babies to daycare, voted, went to the DMV to renew my license, got a haircut and then returned home. At home I proceeded to move all of the boxes back into the basement, taking a huge risk since we have another potential flooding Nor'Easter on the way tomorrow. I also moved all three air conditioners to the basement. I'm pretty sure I will feel elderly tomorrow from all that lugging. 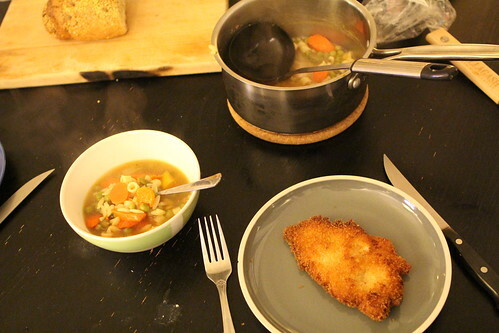 After that I found a moment to make a quick dinner before picking the boys up from daycare. 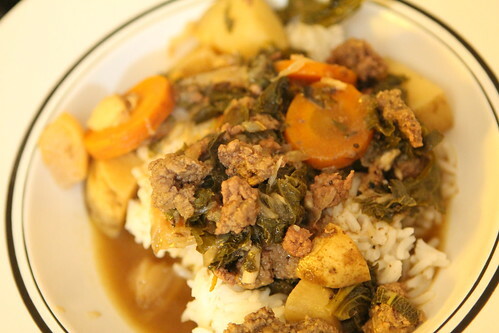 I cooked some garlic, onion, carrots, turnip, potatoes, and kale with a little beef broth and butter. I served it over plain white rice. 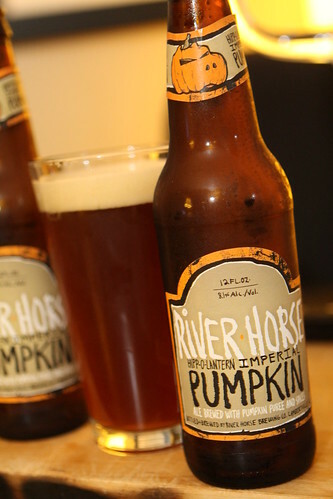 For beer we finally were able to return to this year's pumpkin beer collection with this Hipp-O-Lantern Imperial Pumpkin Ale from River Horse Brewing Co. This was my favorite beer of the batch. I'm still a little under the weather but it seemed to have the most subtle balance of flavors of any of the pumpkin beers I've had so far. Here's where it stacks up for 2010. It was nice to be able to return to some level of normalcy after the crazy week we just had. It was also nice to park the Wombats in front of the TV and spend the late evening hours explaining to them how the Electoral College works. They totally don't get it. Labels: babies, beer, How'd we use it?, Natural Disasters, Special Occasions, Travel, Under the weather, weather, What'd we get? Hi Nate, glad to hear you are all well and came through the hurricane safely. I guess I am your only blog reader who is not on facebook, so I was wondering how you were doing. You were wise to flee. My mother stayed in Rye and was without power for about 5 days. 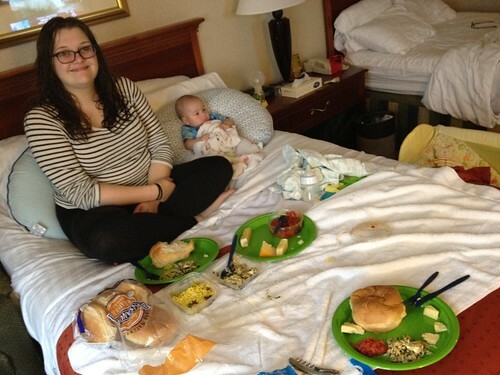 Yes, it was no picnic moving from hotel to hotel but it would have been very difficult with no electricity or heat with two babies. Just glad to be back to normal. Hoping today's storm doesn't ruin things again.